This interview took place on: August 24, 2017. Click here for Rusty Shipp's Artist Profile page. JFH (Nicole Marie Vacca): How old were you when you started playing music and writing songs? Russ T. Shipp: I started taking guitar lessons when I was 12, and that kind of got the ball rolling with me getting immersed into being proactive with music. I've loved music my whole life, but it wasn't until a few years after getting started playing guitar that I was challenged to try out songwriting. I actually didn't like taking guitar lessons, but when I started writing my first songs, that's when the switch was flipped in my head and I just became absolutely obsessed with it. I've always been an extremely artistic person, since I was born, so for me once music became something artistic and creative, that's when I really just fell in love with it and I became obsessed with it and it changed the whole course of my life. JFH (Nicole): The band's name Rusty Shipp is a play on your name Russ T. Shipp. If you had a different name, would you have still ventured into "nautical rock"? Russ: That's a great question. I think that there would be a certain element of nautical rock-n-roll in it, because I've always been drawn to surf rock, so there would definitely always be a surf rock, nautical, underwater feel to the music. But certainly, having the band named "Rusty Shipp" definitely solidified the trajectory that I was taking the band with our direction. I'm actually trying to make music that sounds like a rusty ship, so it's kind of rusty, like grunge rock, punk rock, is, kind of grungy and rusty, but then also "ship" has kind of a nautical, oceanic surf rock vibe to it. JFH (Nicole): Who are some of your musical influences? Russ: One of the things that dramatically inspired me to be a songwriter was when I fell in love with The Beatles, and I just became obsessed with The Beatles, and that really inspired me to do songwriting. It showed me the beauty of interesting, peculiar chord progressions, the combination with peculiar, catchy vocal melodies, and just how powerful that combo can be, of just chords and melodies, and how something simple like that could be so profound, and so catchy, and so powerful. So, The Beatles are my biggest influence, by far, because I personally think that they're the greatest songwriters that have ever been. They could produce creative, catchy, interesting melodies better than anybody in history, done, in my opinion. There's a reason they've sold over a billion albums and people are still rabid fans to this day, 50 years later. As far as more modern artists, I'm really big into Muse, I think they just make amazing music that's really interesting, really creative, really catchy, and it has amazing hard rock riffs and stuff, and I'm really drawn to that. The other band that I'm really influenced by is Thrice. And it's kind of the same thing as Muse, they just have these really creative, catchy riffs, and like The Beatles, these really catchy chord progressions and vocal melodies. The reason they've my favorite band is that they have really thought provoking, philosophical, and sometimes spiritual lyrics, and that's kind of what distinguishes Thrice from The Beatles and Muse, is the lyrics. They've got all the other stuff--the energy, catchy riffs, and melodies and all that, but they also have the element of really inspiring, thought provoking lyrics. So Thrice is probably my #1 role model band, like everything I've wanted my band to be. JFH (Nicole): And I gather you like Dustin Kensrue's solo work as well. Russ: You know, I do, and he's my favorite lyricists of all time. He has one of my all-time favorite voices. Very dynamic. JFH (Nicole): Can you share the story behind the album's title Mortal Ghost? Would you consider it to be a concept album? Russ: First of all, I should say that "Mortal Ghost" is a name that I've had in my mind for many years. At one point of my life it was actually the name of the whole band that I was in when I lived in the DC area. When that band broke up, I just loved the band name so much that I thought "I've gotta do something with this one day" and I had mortalghost.com that I bought, because i thought one day there's going to be something cool to do with this, and just talking to different people, they'd be like, "Man, that would be an awesome name for an album." I just absolutely love that word; it's so intriguing and thought provoking, so I thought "what better album name could I possibly have than Mortal Ghost?" Not trying to sound egotistical or anything but I think it's one of the coolest sounding album names of all time. I just love it, I can't get enough of it. Russ: Yeah, exactly! It does tie into the concept of the album, where the album does not have a hard concept, but it's definitely very thematic, and it has some very consistent themes that run throughout the whole thing, both lyrically and sonically. With our music we are definitely trying to create a sound that sounds kind of spiritual and divine, some would say kind of ghastly-sounding, otherworldly. There's a lot of places on the album where it does sound ghastly, it sounds like ghosts singing or something, and that's something that we're really trying to do with the overall sound for Rusty Shipp, is to have this kind of divine, ghastly element. So that's how I came up with the name of the album, Mortal Ghost. JFH (Nicole): I just thought of the interlude in "Lighthouse" when you said that. Russ: Oh yeah! That could be our number one favorite part of the whole album. JFH (Nicole): You incorporate your faith into your music pretty seamlessly. How do you find the balance in conveying spiritual messages without compromising artistic authenticity? Russ: I was definitely raised in a Christian rock world growing up and I saw a lot of artists walk that line well, I saw a lot of artists that did not walk that line well, in my opinion, but one artist that did walk it well was dcTalk. I should have mentioned this in my list of favorite bands, but dcTalk is probably my favorite artist--one of the first [bands] I got into that to this day I think their work is phenomenal. It is like the top of musical quality and ingenuity. I think that their work is timeless to this day. So I should say that bands like them and Thrice kind of do what CS Lewis did in his writing, and Dustin Kensrue talks about this, how CS Lewis referred to it as "sneaking past the watchful dragon." That dragon is the censorship of society. I don't want to write lyrics that are blatantly or overtly Christian to people who are going to instantly dismiss it, so I want to do it in a way that is subtle, so as to plant seeds, but also such good quality of music, that even people that disagree with my world view still can't deny that the music is really good, that they still want to listen to the music. I'm hoping that in that case it "sneaks past the watchful dragon" and then maybe even if by osmosis, the deeper truths in the music can kind of connect to people on an emotional level, and have time for the seed to take root, so to speak, when otherwise the seeds would never get planted in the first place. JFH (Nicole): What inspired you to rework "Davy Jonesâ€¦" from the Hold Fast to Hope EP and include it on Mortal Ghost? Russ: That's mainly because with our full length album we had access to a superior quality recording studio, so I definitely wanted to see if there was any songs from our EP that I would want to re-record it with this amazing opportunity we had, this pro quality. That was really the only song off the EP that really fit the theme of the Mortal Ghost album. Plus, that song is our biggest fan favorite, as far as shows that we play and songs that have played on the radio in Nashville. It just went with the album perfectly, it was everybody's favorite song, and I wanted to include it on the album. JFH (Nicole): It definitely fits with the theme of the album, and I like the fact that in the beginning it sounds like a very nautical song, like it sounds like something sailors would sing or pirates would when you're doing that rhyme, "Cross my heart, and hope to die..."
Russ: Yeah, I was trying to make my own sea shanty right there, that's what I was trying to do. JFH (Nicole): "Hotel Bible" plays around with song structure and tempo. Can you tell us about the writing process for this song? Russ: That was a co-write that I wrote with a friend back in college. I went to Liberty University and one of my friends there was in a band that actually performed that song at Liberty. I heard the song and I heard it going in a different direction lyrically than their band was taking it, so I kind of hijacked the song, so to speak, with his permission, and took it in a whole different direction. It's funny because sometimes I'll hear a song, and I'll feel like the music of the song is trying to communicate a different message than the author wrote the lyrics about. I feel like the music itself has a message which is more appropriate in this direction. I was inspired to take it in a direction that I thought the soul of the music itself was actually going. It's an interesting song, because if you don't see the title of the song, you would almost think that the song is talking about an affair. Which I'm pretty proud of that, from an artistic perspective I think is pretty cool, then you see the title of the song is "Hotel Bible," and you realize that the affair that's happening is actually between an unbeliever and a Bible that he's not supposed to be looking at. So it's kind of like an atheist is secretly in a hotel room having an affair with the Bible, which is a pretty cool concept. I'm really into writing lyrics that are very provocative, because I want to attract people to listen to what the message is in the song, and also from an artistic perspective, I'm always wanting to do something that's interesting and fresh and creative and raw, that's really going to grip people and hold them there for the whole song. It's a pretty cool song, because it's essentially a spiritual journey from somebody who is an unbeliever, or doubting, or an atheist, or something, and then it walks through their mental, spiritual crisis with the "temptation" of this hotel Bible that they can't take any longer, and then by the end of the song it's like their eyes are opened and they're enlightened to the spiritual world, and they believe. Russ: Yeah, the music definitely fits the emotional turmoil of the song, and just the wavering, going back and forth. It's pretty cool in that aspect. JFH (Nicole): What drew you to the story of the SS Naronic ship sinking? Russ: Good question--well, some of the songs from this album, I had them written for awhile. I had this musical arsenal and I was thinking man, these songs are really good, one of these days I'm going to use them, so a lot of songs were kind of constructed in that way, like me taking my best songs out of the arsenal that fit with the theme of Mortal Ghost. But there were a few spots on the album that were blank, namely track three and track five, that I was trying to fit in with this whole thematic concept that I was constructing. So I was like, okay, I need two all-out nautical songs that fit with this nautical rock-n-roll theme that my band is trying to hone in on, so I was thinking about nautical ideas and I think I watched a documentary on the Flying Dutchman, the legendary ghost ship, and that got my brain thinking about nautical ideas. When I was in this mindset of nautical ideas, I got into this zone of songwriting--I turned out all the lights in my room and went on youtube and typed in "sunken ships" because that was kind of the main theme of the album, I wanted this kind of underwater, bottom of the ocean feel, and also our band is called Rusty Shipp, so this kind of rusty, nautical, underwater sunken ship feel. So I turned out all the lights, played videos of sunken ships with the sound off and then I got out my guitar and recorded myself just playing whatever came into my head, and I did that for maybe 30 minutes, just coming up with random riffs and stuff. Weeks later, I went back to that and I picked out the best riffs that I had made and I constructed it to be a song about a sunken ship, which would turn into "SS Naronic." So then I wanted to think about "Ok, what significant sunken ship stories are out there?" And I didn't want something overt like Titanic or something like that, I wanted something creative, like a ship that no one has ever heard of, but still had an interesting story. So I just went on Wikipedia and honestly, I just looked at a list of ships that disappeared, and I picked the ships that I thought had the coolest names that would make a good song title, and I thought SS Naronic was a really cool name. I read the story about it and I was like, oh my gosh, this is it, so much songwriting potential here. And then when it started talking about how they actually found messages in bottles that were written while the ship was going down--that's the only evidence they have of what happened to them and why it went down, and I was like, oh my gosh, talk about a raw, heart wrenching story. People were actually writing messages in bottles as the ship is going down. I was like, dude, I gotta take these and make them into lyrics. Russ: Yeah, I thought that was interesting, which makes sense, if you're about to die, it's time to call out to the Divine. That's basically your last shot. JFH (Nicole): That's really cool how that worked out, and I like the name "SS Naronic." Russ: It actually worked out perfectly, because the riffs that I came up with in my room were kind of like "bah nah nah nah nah," so ideally I could find a ship name that has the same number of syllables as [this riff]. JFH (Nicole): That was providential. Russ: Yes, it was, even though it's a very depressing song, and to this day my mom says she sometimes has to skip this one. JFH (Nicole): There are some very mesmerizing, atmospheric interludes throughout the album, particularly in "The Lighthouse" and "Davy Jones." Can you tell us about the production and the mixing process? Russ: We were working with this producer, J. Hall, and he's done a lot of significant albums in the past. He did the most recent House of Heroes album, Colors, and he's done some albums by Delta Saints and As Cities Burn, among others, so he had a lot of experience in this hard rock world. I met with him and he was really excited to do another conceptual, thematic album, after having just done Colors with House of Heroes, and that was a full on concept album. So he was really excited to get to do another project that was really artistic, and when he heard about us being a nautical rock and roll band, trying to make an album that sounds like this underwater grunge rock, he was really excited to do something creative and ambitious like that. So he was totally on board with everything, in his mixing of it, and recording and producing, he really tried to just bring out a lot of that atmospheric vibe to make it sound like it was underwater, with lots of reverb and cool effects on the guitar and stuff. And then also, the other side of that is to add this ghostly element to it while still being nautical, so that's the balance where you have songs like "Lighthouse," but it has a very ghastly element to that because it's talking about the Divine, and at one point it's like there's a Divine manifestation in the middle of the song, so we really tried to go all out with the whole ghost thing for that part. And then as the name Mortal Ghost implies, there's a lot of ghastly elements, like "Davy Jones" where it says "a ghost ship appears / and there's a crew of souls whose singing I hear," and it's like trying to make it sound like a crew of ghost souls on a ship. That was one thing we tried to tie throughout the whole album, so it keeps reappearing here and there to tie together this Mortal Ghost theme. JFH (Nicole): He did a great job with the mixing, because when you listen through headphones it sounds like certain things are forward and there's almost depth to it, it's not just all flat. Russ: Absolutely. It's just amazing, I'm so happy with the album, I can't believe it. I listen to the album in the stereo of my car, and I'll take it out and put in some Foo Fighters album, or something, and I'm like "Man, our album sounds better than the Foo Fighters!" And it seriously does, in my opinion. The drums sound better, the vocals are great, all the effects are just awesome, I'm somebody who's like really excited about the music that I'm making. Some people try so hard to not be egotistical or humble or whatever, but I'm like, "Man, I wanna make music that I'm crazy about!" There's so much music in the world, the last thing that we need is more music that's just okay. I only wanna listen to stuff that people go all out to make, like this is their whole life's work and they put everything into this. They're excited about it and they love it and they love their own life. That's the kind of music I wanna listen to. I hope that people, when they listen to this album, they get a sense of that, that I'm putting everything into this thing. JFH (Nicole): Can you share the story behind "Caligynephobia"? It seems like many bands today don't want to directly address topics like purity anymore. Russ: First of all, let me say that when I get feedback from people, when we released the album, I was thoroughly shocked to find that of everybody that I got feedback from, that was the most common song that people said was their favorite song on the album. I was like, "Really!?" That song is so in-your-face and aggressive and the lyrics are edgy and provocative, but people were like, "Yes, I love that song." I was talking to a guy today about it, he says as soon as it starts he just gets pumped up and wants to go exercise. Exercise and/or smash stuff, I think is what he said. So, with that said, this is kind of the definitive surf punk song on the album, which is one of my all-time favorite styles of music. This was my attempt at writing my favorite song, which included all my favorite styles of music--surf rock, punk rock, grunge rock, and I was like, okay, I was coming up with these riffs, and I selected my favorite riffs that I had in my music arsenal that I had written. And I thought "If I was to write one song, and I wanted it to be my favorite song, what would the lyrical content be about?" It came to me, the phrase "hot chicks are after me," I just thought that was so hilarious, and so awesome, I was like, dude, I just got to make a song like that, that is just so hilarious, but at the same time, this is actually a topic that I'm very passionate about, the topic of modesty, and a lot of my friends recognize that about me, like it or not, some of them don't like that I'm so particular about this issue, but for me personally, it's a very important issue, and something that I have very strong convictions about in our society. I'm in no way trying to sound chauvinistic or like a puritan, or whatever, but I do think that, especially as Christian people, or anybody that's really wanting the best for society, and a society that's functioning optimally, I think that we really need to dress in a way that is going to show where our priorities are, and if our true highest priorities are for the good of mankind and creating an environment which is going to cause as little friction or problems as possible, then I think we have to be a little bit sacrificial in the way that we dress and put the greater good of society, and humans in general, above what we think looks good or is fashionable or is going to get attention or be attractive, that kind of thing. That's a really loaded topic, but that's my two cents on it. JFH (Nicole): We really liked your cover of The Beatles' "Helter Skelter." How does it fit in with the story being told on Mortal Ghost? Russ: Well, I wish that I could say that it has some kind of tie-in to the story, but songs like that are what keep the album from being a true, total concept album. It doesn't really fit into any kind of story, the only thing is that that is a song that my band covers live at every show, and it's always a fan favorite, and some people are like, "Oh my gosh, I love what you did with 'Helter Skelter'!" So even though it didn't necessarily fit with the whole Mortal Ghost thing, we thought we've gotta include this one. And you know what? People always love cover songs on an album. It's just kind of like a little extra treat on an album. So I was willing to take the bullet on that one and take the risk of jeopardizing some of the artistic feel--I thought that the pros outweighed the cons, personally, for "Helter Skelter." JFH (Nicole): What's up next for Rusty Shipp--any tours or shows? Russ: We have some shows lined up--we just played in Chattanooga, Tennessee last weekend. Of course, we're in Nashville, so we've got some Nashville shows coming up. We got a show in Indiana where we're going to be playing with the bands Smile Empty Soul and Tantric. It's cool because it's also going to be a benefit concert for a children's hospital and they're also doing a suicide prevention benefit type thing, and they asked me to play that song "Hallelujah" [by Leonard Cohen], so I'm going to do an acoustic version of that song. I think that's kind of in honor of all the people that have been committing suicide lately, like Chris Cornell. Russ: Yeah, and I think they also played the song "Hallelujah" at Chris Cornell's funeral. So they asked me to play this song at this suicide prevention show. So that's cool, I'm really excited about that, that's kind of an honor. And then we're playing another show coming up with Chuck Mosley who was the singer in the band Faith No More and also Bad Brains, a harcore punk rock band. So we have some cool shows coming up with that, and aside from that we're just starting to figure out what the next direction is artistically--are we going to do another album or what? I'm kind of leaning towards doing a full on concept album next. Definitely there was a glimpse for sure of that in Mortal Ghost, but it wasn't necessarily one consistent story running through the whole thing in every song. I feel like that's kind of the next step for me as an artist, that's kind of the pinnacle of songwriting, is the storytelling of a concept album. So I'm thinking that's going to happen at some point. So we're just right now figuring out how to keep this nautical rock-n-roll, ghastly, grungy thing going. JFH (Nicole): So are you thinking like The Odyssey, or pirates, or the Navyâ€¦? Russ: Actually, I'm thinking like all three of those things being mentioned. JFH (Nicole): Since you're playing alongside secular bands, I mean, I'm sure you've played with Christian acts as well. Russ: We actually have not played with Christian acts. We've been exclusively non-Christian, because we're, for the most part, not targeting a Christian audience, it's almost exclusively a mainstream, secular market that we're targeting. JFH (Nicole): Nice. So do you find that secular bands treat you differently, because they know you're a believer, or do you think they don't catch on, or do you think they treat everyone equally, like how has your experience been? Russ: It's been all those things. Some people would never guess that we're Christians in a band, some people would never guess that the lyrics have Christian content, or spiritual references, because a lot of people don't listen that deep with music and with a lot of our songs it's not explicitly Christian, even songs like "SS Naronic," "God please show me that there's more than thisâ€¦" that's not necessarily Christian, that's just humans in general are going to be questioning things and crying out. A lot of people can very easily look at all that stuff and not even think twice, like, "Oh, there's some hard rock band, they probably have the same view as all of us." With that said, I do think, and I've also heard from people, that they can't put their finger on it, but they feel like there's something different about our music. They can't put their finger on it, but they feel like when they listen to our music there's an inner sense of hope that permeates through the music, even though it's not something obvious, it's just kind of more intuitive, like they can just feel it. Some people have actually told us this, which is awesome. The other side of that is that some people do hear the Christian references and they're like, "Oh, this is some Christian rock band." But what's interesting is that I had never been dismissed by anybody, even the people that think we're a full-on Christian rock band, or whatever. Those people have been very friendly and welcoming to me and my band, and I think that's because regardless of what I believe, they have to recognize that it's quality music. And regardless of what the lyrics are, they recognize, "hey, this band rocks, like they've got awesome, heavy-hitting riffs, great melodies, thought-provoking, intelligent, artistic lyrics, so regardless of if this person's world view differs from my personal world view, or differs with the majority of rock music's world view, I have to recognize that it's quality music, and quality art." It's pretty cool because everybody who hears our music, they're impressed by it, so they have a natural respect for me and my band and our songwriting. Which is cool, because of the songwriting that paves a bridge in between us, a bridge of mutual respect, where they might not agree with me if we were talking in person about things, but they have respect for somebody that they admire their artwork. Kind of like I alluded to before, my hope is that if the music is good enough, catchy enough, people that are blatant atheists or satanists or whatever will still be willing to listen to it, because of the music. In the same way that I am tempted to listen to music that might have evil lyrics, [yet] it's so catchy. It's the same exact thing. I'm hoping that it's the same thing with them, like, "Dang, I hate when this guy is singing that cheesy, Christian crud, but man, that riff is killer! And I just happened to listen to it." And I'm like, awesome, that's what I want. Same thing that the atheistic bands are doing, I want to do the same thing, but with a more positive angle. JFH (Nicole): Chris Smith and Michael Weaver asked me to convey this message, but it expresses my sentiments as well--it's been great partnering with you for this release. We're super grateful for your contributions to our free indie mp3 page and to the sampler that we just released. Several of us have been spinning Mortal Ghost throughout the summer, and we're really enjoying this record. Russ: What an honor to hear that. I really appreciate you mentioning that to me. I'm so thrilled that you all enjoyed it so much, and that it's something that really resonated with you all. That's phenomenal. I'm just so humbled and blessed by that. 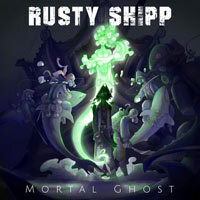 Rusty Shipp's latest album, Mortal Ghost is available now wherever music is sold!